These prestigious garments are designed in the same collaborative approach as Bespoke Tailoring to create an original Wedding Dress or special Occasion outfit. The fit is extremely important not only to your body but also to your needs on the special day and in the future. All pieces are made with an eye to the future to ensure value for money and are made with beautiful fabrics in a wide variety of textures, colours, qualities and price brackets – indeed a 100% Silk wedding dress can start at around £750 depending on the complexity and your fabric choices. Bridesmaid’s dresses and Mother of the Bride/Groom outfits, in Silk, range from around £250-£400 on average depending on fabrics and designs. With Bridesmaids and Mothers of the Bride I take the same care to design with you your perfect dress or outfit. Having access to a wide range of suppliers I can make to your specific requirements and can cater for an infinite array of ideas and styles whether classic or themed or even quite quirky. So bring me your ideas and I will make them a reality for you. I also offer an alteration service for wedding apparel, I can alter wedding dresses, bridesmaids dresses, mother of the bride outfits and even the groom's suit. All will be fitted as if they were made for you when I have finished with all the integrity of the original garment intact. If however you have found something interesting that needs major remodelling to suit you, that's no problem at all, I relish the challenge and can really bring your outfit to life with special touches such as piping or matching covered buttons. 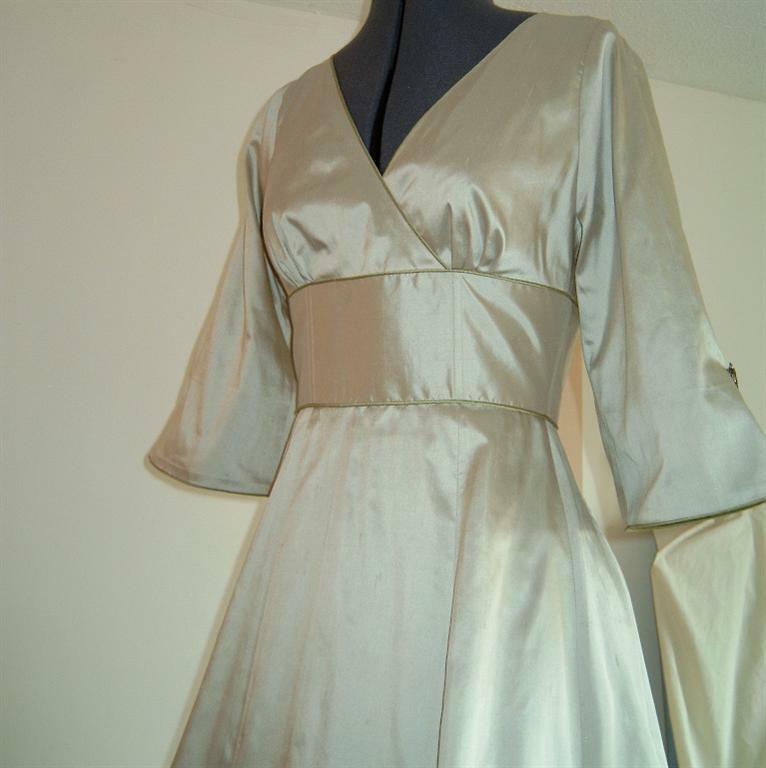 When you have had your special day we can think about making your outfit more versatile so you can really get great value for money, even the wedding dress can have a new life; my own was made into a christening gown for my children many moons ago - there is a myriad of ways to use it again. Please visit my Bridal Gallery to see my previous work.